There are 46 reviews of Eau de Gentiane Blanche. When I first got this, it was the weirdest thing I'd ever smelled. (Now that honor goes to Chypre Mousse, but whatever.) And the weird was vegetal, and very very green, and cool, and refreshing; the olfactory equivalent of drinking gin from a hollowed out cucumber. But over time, the weird faded. (I had a second hand bottle, so not sure how old it was, but I had it for about 4 years before using up the remaining 80 of 100 mL) It was still nice, but not really special. Kind of green, kind of vetiver, absolutely fine and lovely in summer, but it really lost its edge. I finished the bottle happily, but will not repurchase this. If I came across a 2-4mL sample, I'd probably pick it up. Green. Dark. Bitter. Unique. Elegant. Minimalist. Sophisticated. Austere. Sleek. Direct. Unfussy. Beautiful. I tried this first with a blind-buy of a travel sized shower gel. And I fell in love. I was slightly nauseous with desire until I got the cologne spray, and it did not disappoint. It opens with a punch of green bitterness that melts into a warm mix of iris (I know, unusual to describe iris as warm) and faint musk with an enduring whiff of cold dirt. On my skin the longevity is moderate, about 5 hours. Wearing this is like wearing a pair of impeccable black leather boots, in a room full of bright pink flip flops. Strange and lovely, this is a whisper that only the lucky can hear. A delightful mossy-woody scent. I would characterize it as resembling a vetiver scent, but without the vetiver! Eau de Gentiane Blanche is simple, clean, fresh, and predictable: A peppery light smoke experience that provides a healthy spiciness that isn't clouded with many other notes. Instantly fell in love with it upon sample, and now I proudly own a bottle. If you want to try an atypical fragrance and may already like the other Hermes scents, definitely give this one a try! This is my current "go to" and in between headier scents perfume. It's also my universal solvent in the sense that if I've tried another perfume that's too floral or otherwise heavy and sweet for me, I'll spray this over it to tone it down. Some rescues and also some nice one-time scents have come my way by doing that. Also some errors. But out of respect to its maker and house I usually wear this one solo. I relish Eau de Gentiane Blanche's somewhat bitter dry greeness, its earthy undertones. Maybe it's the name "gentiane" that makes me feel when I wear it as if I've finished my walk up a mountain path and come to a clearing where I can sit down and just enjoy the mixed aromas of nature for a while. I might also wear this if I had to go to a party or some such occasion I didn't really want to be at. It carries a reminder of independence. The previous review is correct in their overall assessment that this is "simplistic", my paraphrase. But that doesn't mean that it isn't exciting. Not if what you're looking for is a simple, clean, fresh, pleasing cologne that isn't loud or boastful in how it comes across. Not every cologne has to be daring to be great. There is a very subtle citrus to this, but if you "blink" you'll probably miss it. It's green, but not overly so. It's soft and light, great for a casual spring day. 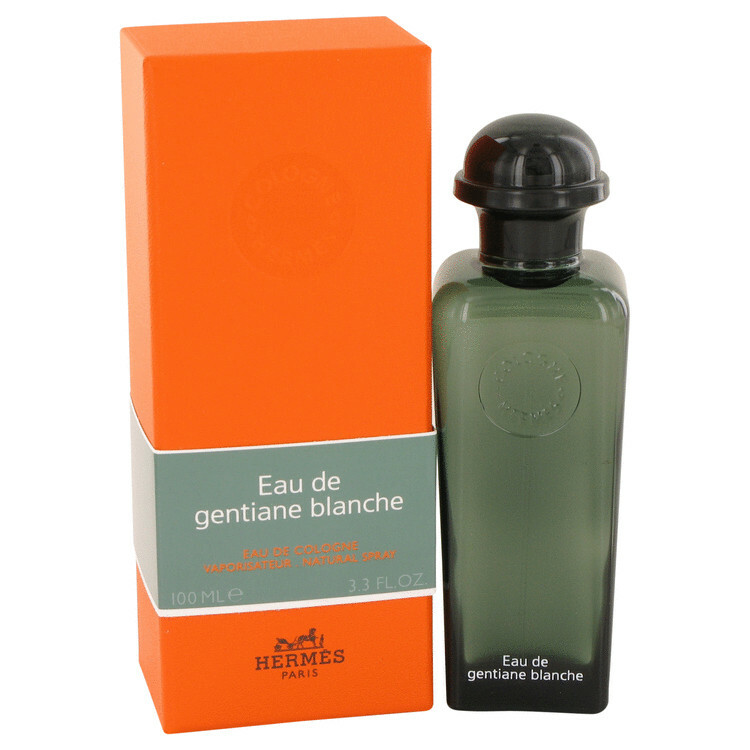 Eau De Gentiane Blanche Hermes For Unisex 3.3 oz Eau de Cologne Spray. There are no member images of Eau de Gentiane Blanche yet. Why not be the first? What about Eau de Gentiane Blanche by Hermès ? Hermes Eau de Gentiane Blanche/Pamplemousse Rose on eBay! !